In January 2018, Betsy became Program Director for TTYL. She has continued educating K-college students through classroom visits and field trips, emphasizing nature discovery, data collection, and restoration of watersheds, forests, and wildlife. 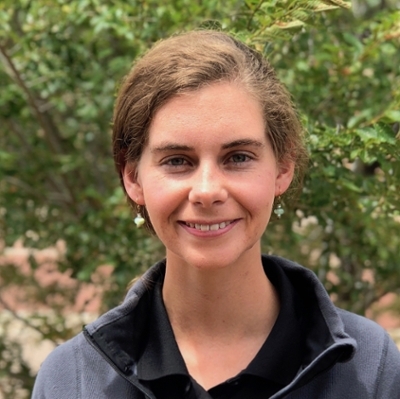 In May 2015, Elizabeth (Betsy) Fulreader earned a self-designed bachelor’s degree in Sustainability and Environmental Restoration through UNM's Liberal Arts and Integrative Studies program. A week later, after attending an environmental career fair, volunteering with environmental groups, she landed an interview with Talking Talons Youth Leadership (TTYL), and became a Conservation Crew Leader at Valle de Oro National Wildlife Refuge. She then became an Environmental Educator, through TTYL, bringing non-releasable wildlife into classrooms to encourage youth to be advocates and stewards for themselves, wildlife, and the environment. In January 2018, Betsy became Program Director for TTYL. She has continued educating K-college students through classroom visits and field trips, emphasizing nature discovery, data collection, and restoration of watersheds, forests, and wildlife. She continues to encourage youth advocacy through program and TTYL’s Youth Advisory Council, where youth are paid a generous stipend to offer their voice on a range of topics.